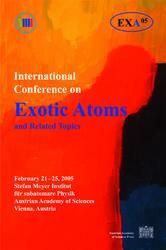 The international conference "Exotic atoms and related topics 2005" (EXA05) was the second such meeting organized by the Stefan Meyer Institute for Subatomic Physics of the Austrian Academy of Sciences in Vienna. The first meeting in 2002 was an international workshop that lasted three days; 33 talks were presented and about 80 scientists attended. The next conference lasted four days, with 53 speakers and more than 120 participants. The large increase in both speakers and participants shows how dynamic the fields being discussed are. Both meetings presented those fields of physics that can be investigated using exotic atoms, namely, fundamental symmetries and interactions. Examples include the testing of CPT symmetry with atoms containing antiparticles, and the investigation of low-energy QCD with hadronic atoms in low-lying states. For antiprotonic atoms, the spectroscopy of antiprotonic helium is defining the limits of the equality of proton-antiproton charge and mass with increasing accuracy. The formation and spectroscopy of antihydrogen, potentially the best candidate for precision tests of CPT symmetry in atomic systems, is being undertaken by several experiments at the Antiproton Decelerator at CERN, although formation studies are still in their early stages. The future of research into low-energy antiproton physics seems promising, due to the partial approval of the FLAIR facility at the future FAIR facility in GSI. Currently, the fastest developing field is the kaon-nucleon interaction, where the existence of a series of deeply bound states has been predicted. The first experimental evidence for this was shown at the conference and further experiments in progress were described. If confirmed, these so-called "K-clusters" will open new possibilities for studying dense cold matter in the laboratory, since calculations predict nuclear densities in these systems to be as high as those in neutron stars. The final results of the DEAR experiment were also important for the K-N interaction. Its measurements of the strong interaction-induced shift and broadening of the 1s state of kaonic hydrogen were more precise than earlier measurements by a factor of two. These results have had a strong impact on the theoretical description of low-energy QCD, as seen in several papers read at the conference. Since more new results are expected in these fields within the next two years, it was decided to convene a third EXA meeting in Vienna, again organized by the SMI, in the early fall of 2007. We are looking forward to welcoming you to Vienna again.